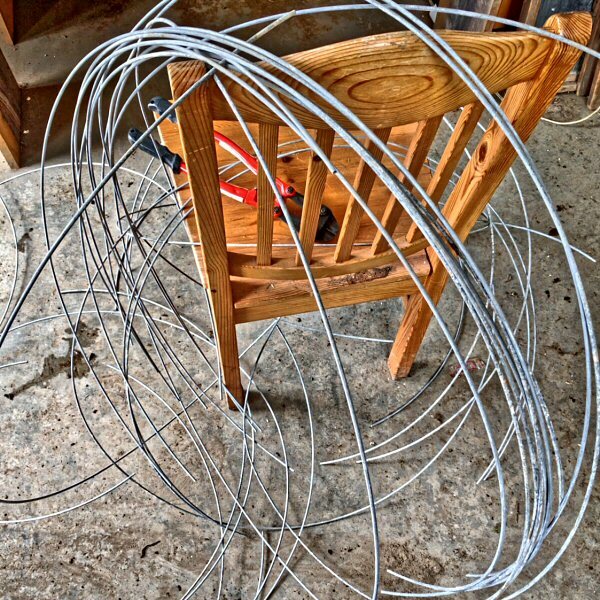 Electric fence wire work, snipping 6-foot pieces of 9-gauge wire for hoops to hold up floating row cover in the greenhouse. Hopefully this wire is stiff enough to do the job, supporting up to three layers of row cover, heavy with moisture from humidity and being dripped on by water condensed on the inside of the hoophouse plastic, or weighed down by ice, when the soaked cover freezes at night. This test batch of about 180′ came coiled, in a circle about 2½’ in diameter, and the built in curve is perfect for stretching slightly to span about 4′ of bed. So, no bending required, it’s all about the snipping!